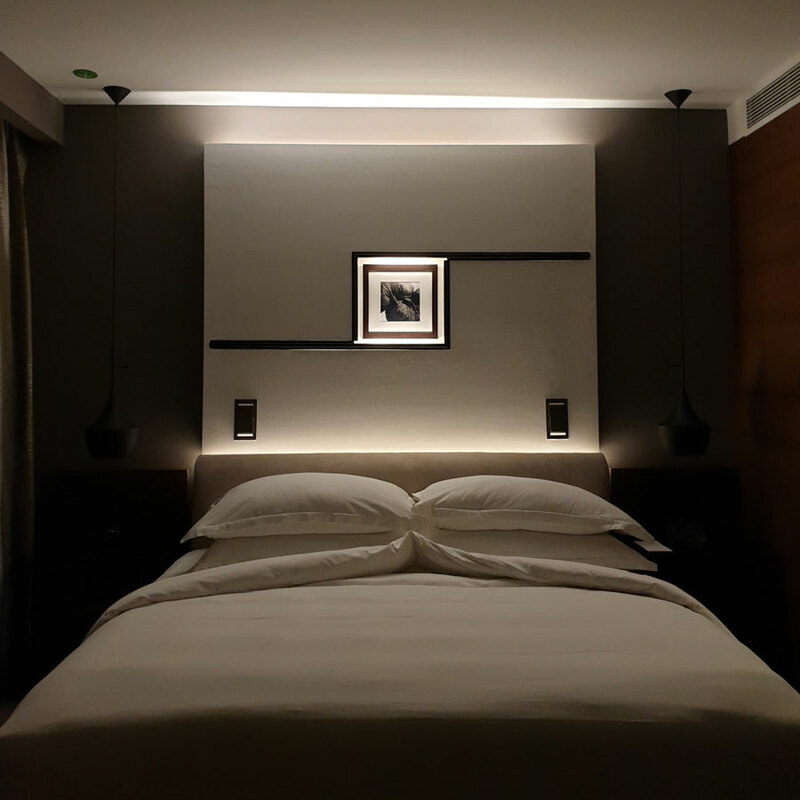 For anyone who is flying over 4 hours to a destination, as much as we are enthusiastic about exploring a new place, what happens mostly is that we are too tired by the time we land, and all we can think of getting to the hotel in the shortest possible time. 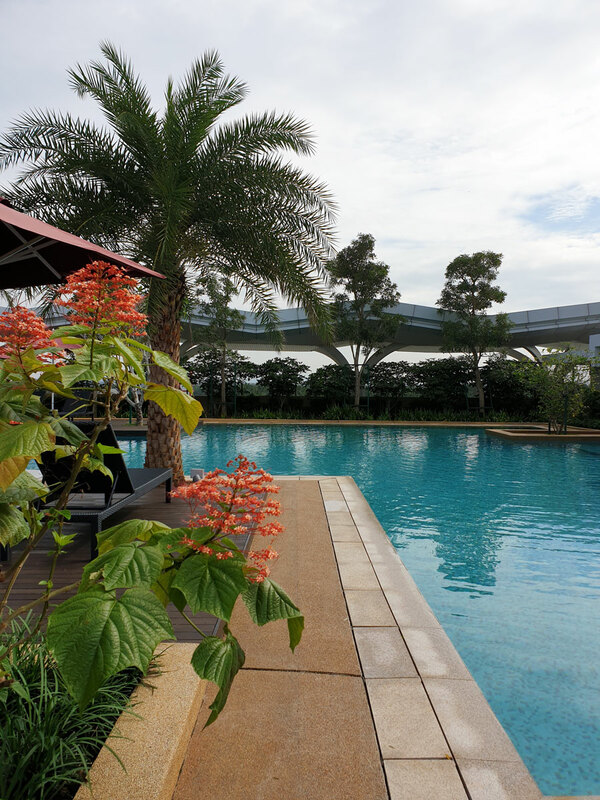 Not too far away from Kuala Lumpur International Airport, and newly opened is the state of the art hotel and convention center of Movenpick. The main structure catches your attention from any distance where it is spotted. And, once you park your car right by the lobby entrance, you enter into a spacious and stunning lobby . There’s so much space and light and a beautiful play of patterns in there. I found it a little hard to get myself moving even after we were done with our welcome drinks. The story behind this stunning hotel is very profound. 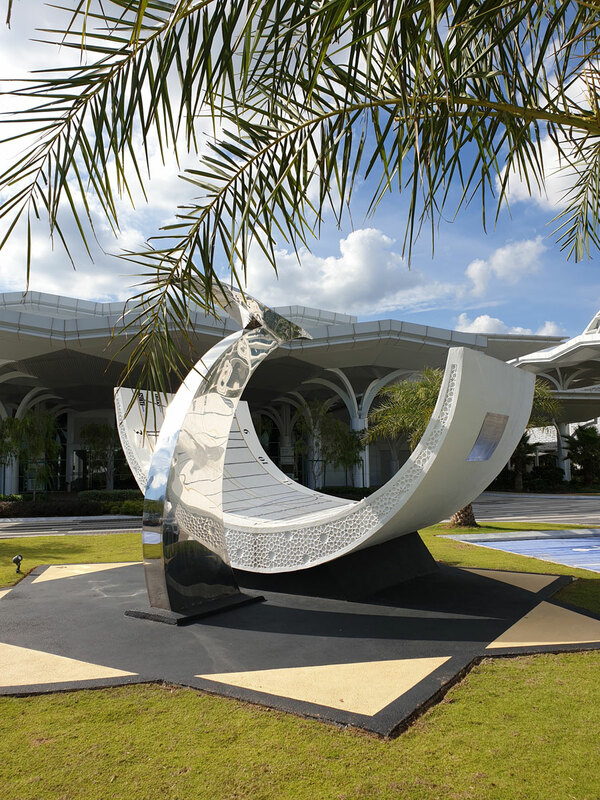 The design of the main structure is said to have been inspired from the position of the hands when kept to make Duaa (a prayer position holding the hands together towards the sky). As someone who has lived all of my life in the Middle East, I find it fascinating to see a new perspective on Islamic Architecture and design. The whole idea of the airport comes from the fact that it was designed keeping in mind the pilgrims who go to Hajj and can stay at a convenient place and depart from the hotel in ease. During the pilgrimage season, the Convention Center turns into an airport to add to the comfort of the pilgrims leaving for Hajj. At other times of the year, the convention center serves its purpose for conventions. 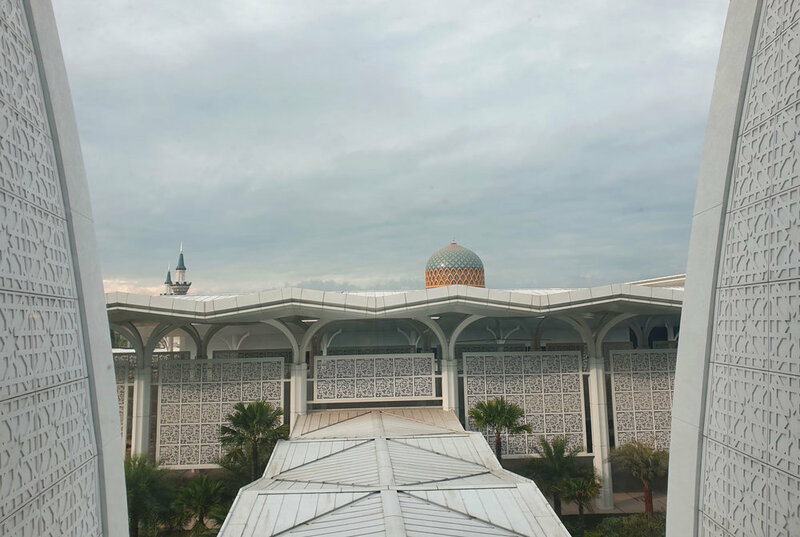 Our room came in with a closet, a small study area, a living space with a rocking chair, and a stunning view of the Masjid Sultan Abdul Samad. 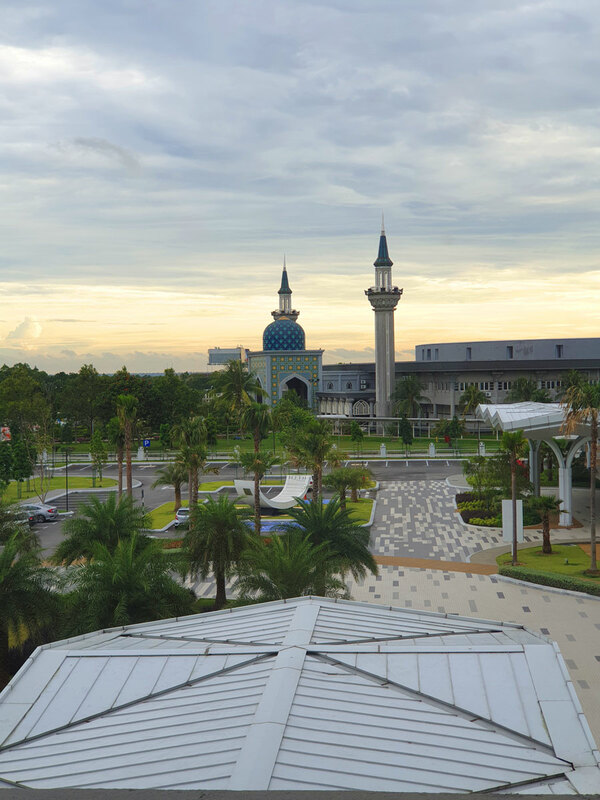 Malaysia has absolutely stunning mosques. I think I would need to compile them into a list very soon. The room also had a stand alone bath tub in addition to the rain shower. The windows stretch from one end of the wall to another adding to enough daylight in the room. 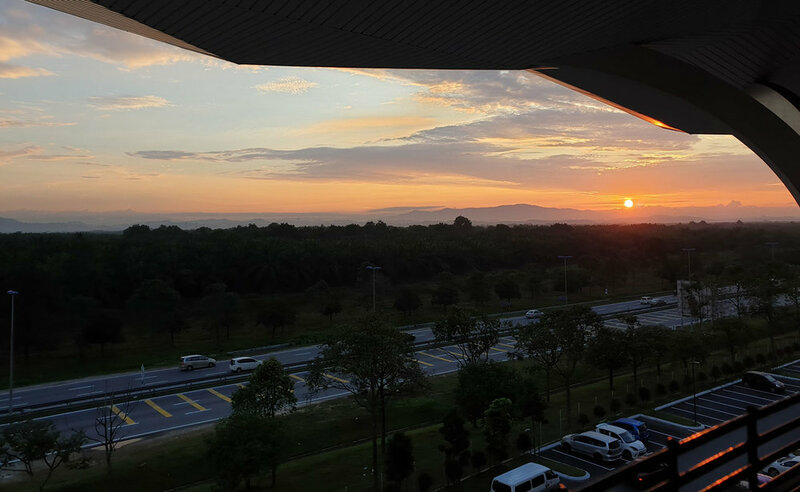 Did I forget to mention that Malaysia has one of the most beautiful skies you can stand and stare at all day long? Little things which I appreciate even more because I have spent most of my life in a desert where clouds make a rare appearance and so do blue skies. The hotel has a stunning pool on the third floor. The best part is they have a separate pool for males and females which gives the much needed privacy people like me look for in a pool. Like I mentioned before, the comfort of the pilgrims have been considered in all aspects of the hotel including privacy. There’s also a children’s pool and a small play area. There’s a tennis court right by the pool. The gym here is separate as well. I think that’s something I need to integrate into my routine already. The view from the gym is just stunning and workout would seem like a breeze. They also have a female and male beauty salon and 14 foot massage pods. The massage pods are a point to where the guests are welcomed with a quick and short massage. 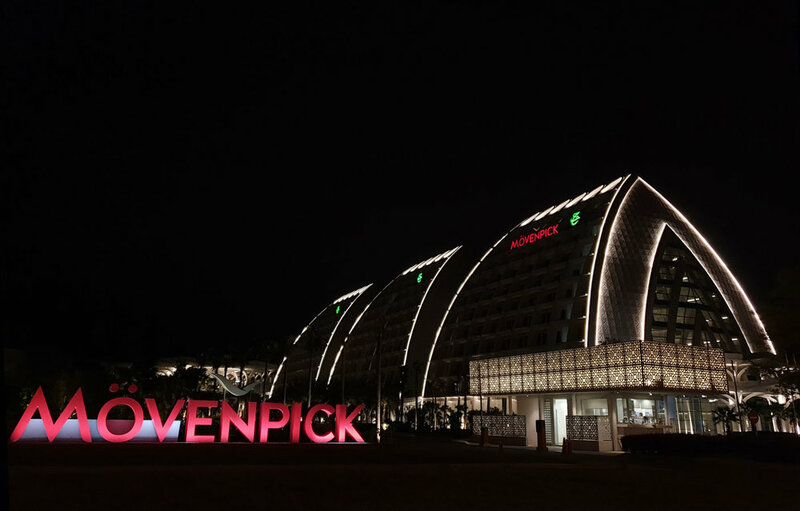 The Spa at the Mövenpick Hotel & Convention Centre has been developed to accommodate express treatments for travellers on their way to Haj, and for businessmen and women attending a convention. Every Movenpick hotel has a tradition of having a chocolate hour. There’s a chocolate hour in the hotel from 5 - 6 pm daily. There is art incorporated around the property in every corner. ‘Ahad’ which takes inspiration from the fact that Allah (God) is only one. The sundial shows the time by displaying the position of a shadow on a flat surface, which has markings that correspond to the hours. Sundials were widely used in ancient times. Temasya is the all day dining restaurant where we had our breakfast during our stay. They have a water rack at the entrance with water from around the world on display. It is the hotel’s signature venue offering classic Malay dishes from each region cooked to traditional recipes. Redup is a middle eastern influenced lobby lounge serving a variety of Middle Eastern and Asian Teas. 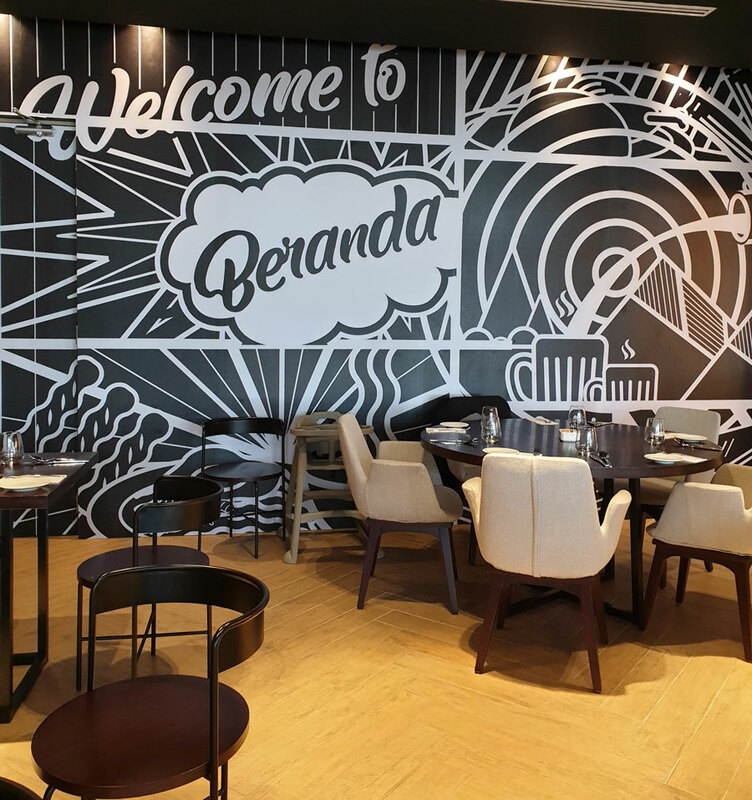 Beranda which is located outside the Convention Centre is a self sufficient coffee snack counter for grab-n-go snacks including sandwiches, small cakes and Malaysian Favorites. This spot opened during the time of our stay and we got a quick glimpse of the offerings here. The property serves only Halal food and is completely dry. Stop by the Sepang International Circuit. It the racetrack for various international motor sport events. If you like seeing a little bit of wildlife and animals, Paya Indah wetlands are quite closeby where you can witness feeding of hippos and crocodiles among other things. Mitsui Outlet Park KLIA is located very close to the hotel. Disclaimer: Creativity with Kay was a guest of the hotel. However, all the pictures and opinions shared here are mine. The hotel was in its soft opening phase and hence, we couldn’t experience the property’s offerings to the fullest.